The first part of Duggan’s claim is true, but somewhat misleading with respect to mental health. After Congress expanded and clarified eligibility criteria in 1984 in response to an ill-conceived effort by the Reagan Administration to reduce disability rolls, there was a rebound in disabled worker awards for mental health and other conditions. But the share of awards for mental health conditions declined as the baby boomers approached retirement because mental health problems don’t increase with age as much as other conditions. On the other hand, the share of awards due to musculoskeletal conditions has grown steadily, more than offsetting declines in the shares due to mental health, cancer, and cardiovascular disease (see Figure 1). As discussed in earlier blog posts, there has been no upward trend in overall disability incidence over the past 20 years. Moreover, the employment potential of disability applicants is very low, even among those denied benefits. Nevertheless, it is reasonable to ask why there has been an increase in the share of awards for musculoskeletal conditions, and why increases in life expectancy due to such factors as a steep decline in smoking and advances in the treatment of cardiovascular disease haven’t led to a decline in overall disability, especially since fewer jobs now require hard physical labor. Source: EPI analysis of Social Security Administration, Annual Statistical Report on the Social Security Disability Insurance Program, 2013. As will be discussed in this blog post, there are a number of explanations that have nothing to do with relaxed medical standards. A major factor is the aging of the large baby boomer cohort, because musculoskeletal ailments increase with age. 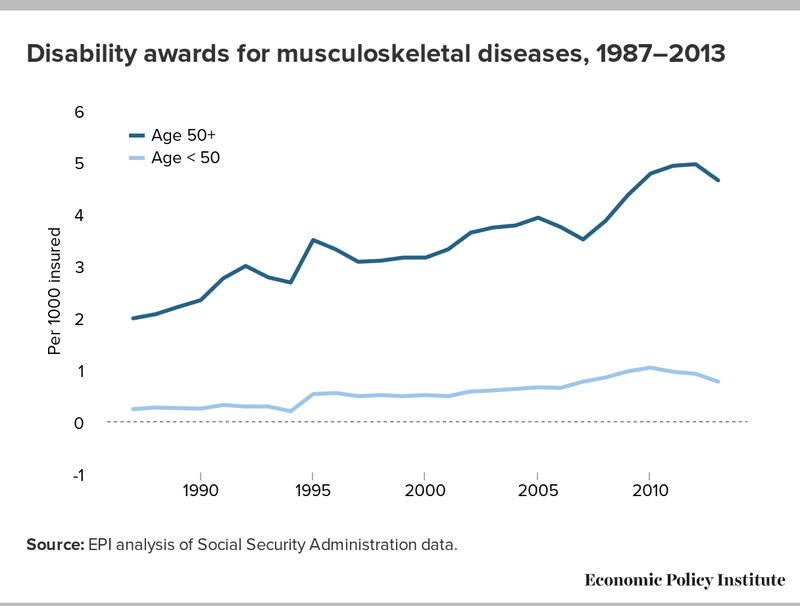 An overview by Social Security Administration (SSA) actuary Tim Zayatz (2011) noted that demographic factors explained much of the increase in musculoskeletal awards, but did not provide detailed breakdowns. Using publicly available data that doesn’t allow for precise age adjustment, the number of musculoskeletal awards by broad age group has trended upward (Figure 2), with cyclical fluctuations and a jump in 1995 that Zayatz attributes to more accurate reporting. Before 1995, SSA reported the distribution of awards based on applicants who were admitted in the initial stage. In 1995, SSA began reporting the actual diagnosis for awards allowed on appeal, which included a larger share of awards for musculoskeletal conditions. Source: EPI analysis of Social Security Administration data. Another reason for the increase in musculoskeletal conditions is that many people in poor health, including poor mental health, suffer from multiple impairments, so advances in the treatment of cardiovascular and other diseases can change the primary diagnosis without reducing overall incidence. Such medical advances also increase the share of awards for musculoskeletal diseases even if they reduce overall disability incidence. Similarly, stricter eligibility standards—disallowing awards based solely on drug and alcohol abuse or obesity (in 1997 and 1999 respectively)—likely increased the share of awards for musculoskeletal conditions. Declining health for some groups of workers also appears to be a factor—though the reasons are not fully understood. While average life expectancy is slowly increasing, health disparities by socioeconomic status have widened considerably in recent decades, with lower-income and less-educated Americans seeing little or no increase in life expectancy. In general, it is not a good idea to make assumptions about the health of disabled beneficiaries from statistics about the general population, since disabled beneficiaries have much higher mortality rates. A likely factor in widening health disparities and the growth in musculoskeletal disorders is obesity, which increased across demographic and socioeconomic groups, but most among less-educated women. While awards based solely on obesity are no longer allowed, obesity contributes to musculoskeletal disorders and other impairments. It is worth noting that while both obesity and smoking are linked to socioeconomic status, there is no simple behavioral explanation for growing health disparities. Obesity is as common among men with some college education as among women lacking a high-school degree. And while more working-age adults without a college degree smoke, the least and most educated groups have seen the largest declines (with high-school graduates and adults with some college education but no bachelor’s degree seeing smaller declines). It is as problematic to generalize about employment as it is about health. Jobs in the expanding service sector often require standing, lifting, and other sustained or repetitive activity even if they don’t require as much hard physical labor as blue collar jobs that are in decline. Meanwhile, sedentary jobs increasingly require computer and other cognitive skills that less educated older workers don’t have and that some workers lose as they age. And as job tenure has declined and fewer workers spend the bulk of their careers with one employer, older workers in poor health are at increased risk of losing their jobs. Some of these explanations point to worsening employment prospects rather than worsening health. However, none suggest that financial incentives are causing more workers to voluntarily stop working or that examiners have relaxed the program’s stringent medical standards, though two musculoskeletal disorders were added to the list of conditions that can qualify as disabilities in 2002. Moreover, viewing any increase in approvals for mental health and musculoskeletal conditions as problematic assumes that the diagnosis and treatment of these conditions were adequate in the past. This is clearly not true for mental health conditions and is doubtful even for musculoskeletal conditions causing debilitating pain. While there is also evidence of over-prescription and unmonitored use of drugs for mental health issues and pain driven by pharmaceutical firms seeking market expansion, there’s no evidence that patients with mild conditions are being approved for disability benefits. Demographic trends, changes in reported diagnoses, growing health disparities, and declining employment prospects—whether these add up to a full explanation for the increased incidence of musculoskeletal disorders, they may not be answers to the most important question. Given the poor employment prospects of all disability applicants, including those who are denied benefits, instead of asking why more people with “subjective” conditions are applying for disability benefits rather than working, we should ask why more marginal applicants are applying for disability benefits rather than retiring or being supported by relatives. This may seem like a subtle distinction, but it has important research and policy implications. Applying for disability benefits is time consuming, difficult, and may carry a stigma, so disabled workers avoid it if possible, especially when the outcome is uncertain—that is, for the roughly one in four applicants defined as “marginal” in Maestas, Mullen and Strand 2013. Having alternative sources of income, such as spousal earnings, pensions, and retirement savings, helps explain the Maestas et al. finding that high earners are less likely to apply for benefits unless their condition is severe enough to virtually guarantee being approved. Higher earners are also more likely to have desk jobs and work for employers willing to accommodate a disability. Older workers with disabilities have fewer options than they did in the past because the share of private-sector workers with secure pensions has plummeted. Even among those with secure pensions, fewer have the option of retiring early or receive retiree health benefits before they are eligible for Medicare. 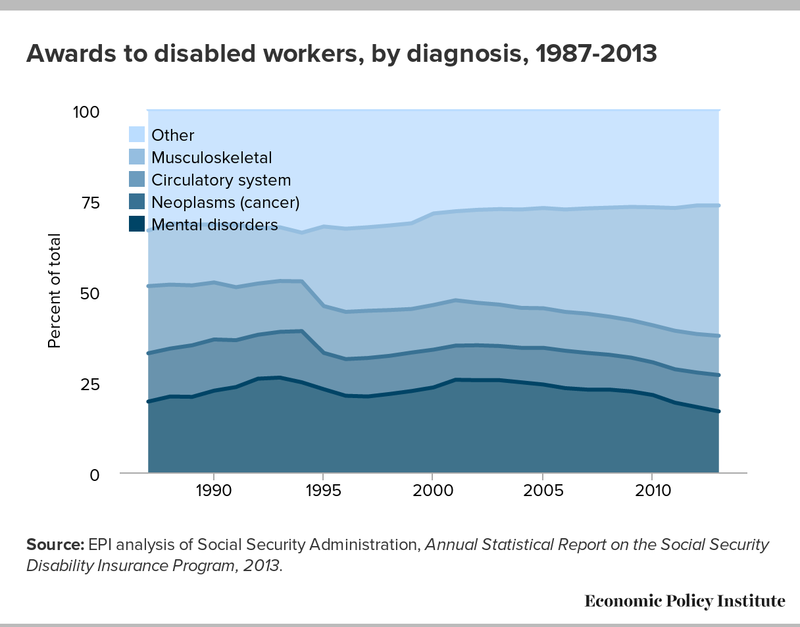 Though private pensions, short-term disability insurance, and employer-provided health care can also tide workers over while they wait to be approved for disability benefits, it is likely that trends in employer-provided benefits have increased the share of older workers in poor health who apply for disability benefits rather than retiring early. Moreover, the share of Americans who get and stay married has declined, especially among lower-income workers, so fewer disabled workers may be supported by a spouse. Unmarried beneficiaries are much more reliant on SSDI benefits and are much more likely to be poor than married beneficiaries. Other developments have had a more ambiguous effect on disability applications. One is the increasing importance of women’s earnings in dual-earner households, which may increase the number of women who apply for disability benefits and may decrease the number of men. Another is the passage of the Affordable Care Act, which guarantees affordable insurance for people with preexisting conditions. Health reform reduced the need to apply for SSDI benefits to become eligible for Medicare, but also made it easier for applicants to remain insured while they waited for SSDI and Medicare benefits. Federal and state safety-net programs have also been cut or eliminated entirely. All told, there’s little doubt that disabled workers now have fewer alternatives to applying for SSDI. Undoubtedly, Duggan would frame these as increased “incentives” to apply, but there’s a difference between voluntarily choosing to stop working and applying for benefits to avoid destitution. Duggan also assumes that the severity of mental health and musculoskeletal conditions is harder to assess and that beneficiaries with these conditions are more likely to be able to work. This is not as obvious as he suggests. It could be, for example, that workers with these conditions are reluctant to apply unless they have very severe impairments because they anticipate facing greater scrutiny. If many applicants with musculoskeletal conditions have weak cases but hope to get lucky with a lenient examiner, we would expect to see a lower acceptance rate and a higher share of applicants who are marginal—that is, whose approval or rejection depends on the examiner. Maestas et al. actually find that applicants with mental health disorders and musculoskeletal conditions are about as likely to be accepted as applicants with other conditions. Applicants with musculoskeletal conditions are also less likely to be marginal, though those with mental health conditions are more likely to be marginal. Moreover, the very small negative effect on employment appears to be even smaller for beneficiaries with musculoskeletal disorders, though it is larger for those with mental health conditions. Previous: Does Disability Insurance Reduce Labor Force Participation?